The version 940 and 943 belong to the kind of hunting product. Let’s see how exceptional they are when bearing a comparison with many other brands as well as best custom knife makers out there in the market. Both version 940 and 943 from the Benchmade have nearly the same dimensions. They are 3.4”, 0.115”, 7.87”, 4.47” and 2.9 oz. for length, thickness, opened length, closed length and weight respectively. In general, all meet almost requirements in term of dimensions for a perfect EDC. In fact, for two concepts of 940 and 943, there are two options available to decide how the knives will look. The first one is of the aluminum handle made outstanding by a blade steel. For more detail, the kind of steel which the designer chose is CPM-S30V (58-60 HRC). Hence, you will find a light change in dimensions. It is an increase by 0.3” in thickness, but the weight still stays the same. With this option, how great it is when two colors including green and black will be ready. 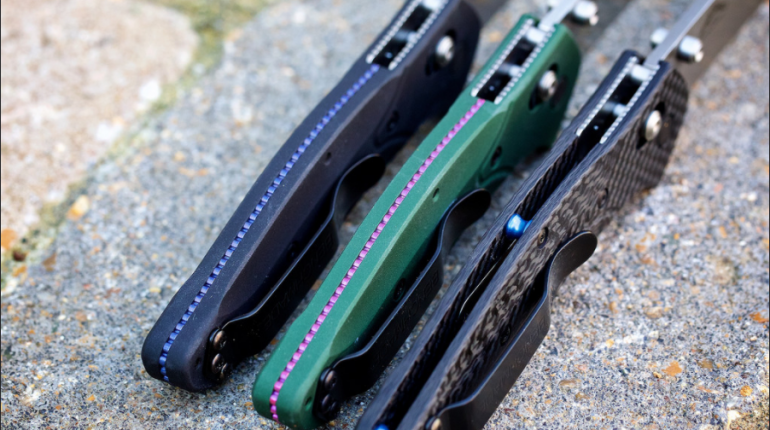 The second type option comes from the handle of carbon fiber. 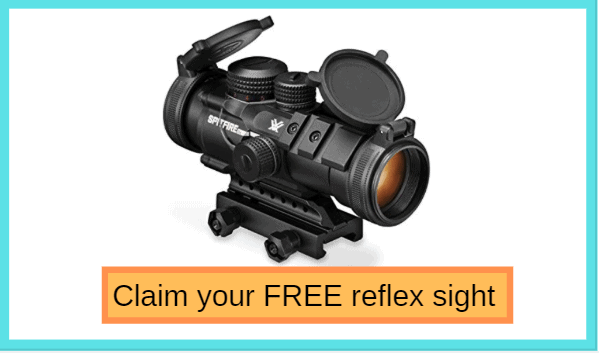 Manufacturers call it CPM S90v (59-61 HRC). Moreover, the thickness will turn to a little greater level, but less heavy weigh (only 2.44oz.). In these products desired by Osborne, you can see that they have exact same handle shape. It is a difference basically between the blades either a reverse kind of chief lift design or maybe stiletto piercing dagger one. With all honesty, it comes down to the handle. 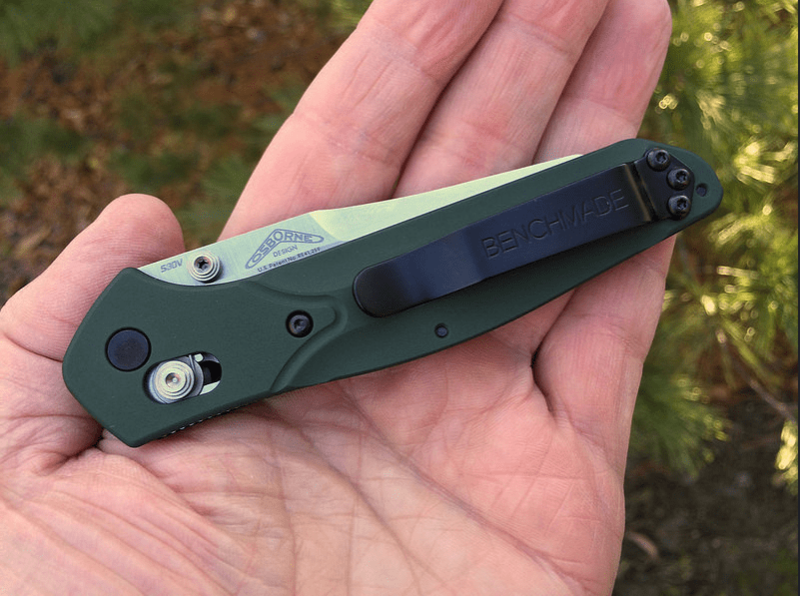 Such part on the 940 is with green and purple liner. And then the black blade or the satin blade probably does not really connect with some users. So, they switch the choice to the version 943 in which a black handle, black blade along with blue strip down the middle. It is not the lockback, not liner lock, not frame lock or even slip joint and friction folder. 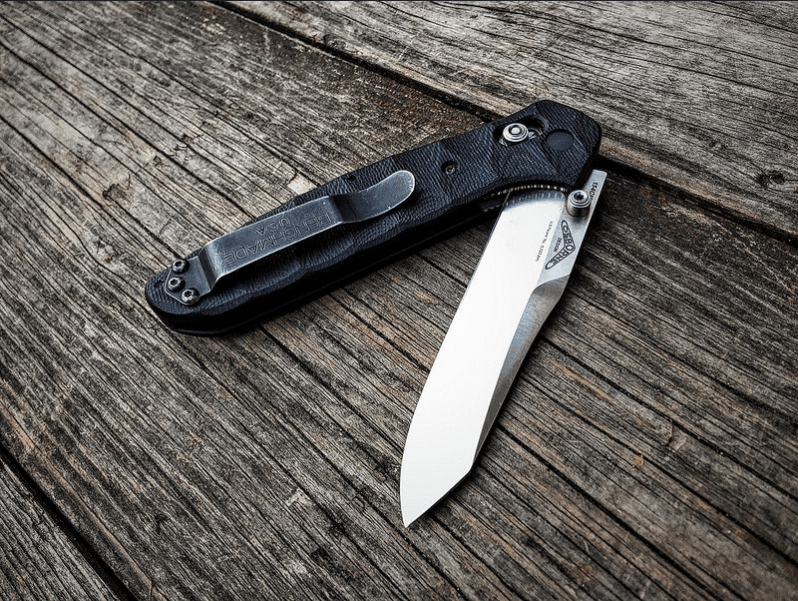 The AXIS is the one which Osborne set as a priority for the opening mechanism of both Benchmade 940 and 943. Thanks to flexibility, the popularity of the AXIS Lock keeps rising for years. Such choice brings knife people an easy use even with only one hand. More than that, it is extremely practical for those who are ambidextrous. The main part of the lock is a bar based on the spring tension principle. Besides, there is a track with a function of moving the bar back or forth into the handle. Moreover, the blade and the AXIS lock which meet at a flat spot. This lets the bar mentioned above stay in place safely as the product is in the opening state. As the closing, the bar is pulled back. Then you stub the thumb and fold the blade. In addition to strengths, this type of lock still shows flaws. Due to too many moving parts contributed to the mechanism, it seems to be much challenging for users to disassemble the knife to make it clean and maintain as well. Furthermore, as for some models which are smaller, the stubs, honestly, are not in a good operation. When creating two versions 940 and 943, the Benchmade somehow offers fans with customized features. If you plan to take use of them as often as you can, do not hesitate to make some changes. Ideas of plain edge blades or serrated ones are all feasible for the regular usage. Basing on such substitutes, it does not matter how tough objects you want to cut are. Sometimes, a coat of satin outside the blade is likely to make it possible for a durable knife. Despite a ton of the best EDC knife under $50, it is somewhat a wrong decision if you focus on the low price much. In comparison with a mass of the EDC knives on the market, the 940 and 943 are not cheap at all. However, they are always worth of investing. Different knives with varying levels of price may bear a comparison in sizes. But for years, you will see differences in the quality. Between the Benchmade 943 vs 940, the second takes over than the other in my opinion. It is because that the blade of the version 940 is more practical in the blade’s bell than the 943. Such feature surely makes the knife more rugged than ever. Moreover, the 940 will be my first pick because of its incredible deals. However, it will be a deal better along with a tanto which can make the product great in the clip-point blade. By contrast, the shape of the version 943’s blade is also outstanding. Besides, it owns an ideal size for carrying purpose. But, do not know why my decision still leans on the 940. Maybe, the advantage from the blade enables the Benchmade 940 become the winner of the game.